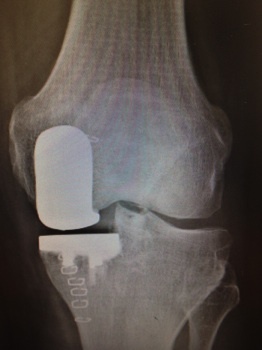 Computer-assisted robot systems, currently promoted by a provider despite significant problems of the system, have the decisive disadvantage, that in this case prefabricated prosthesis are still inserted into the patient. 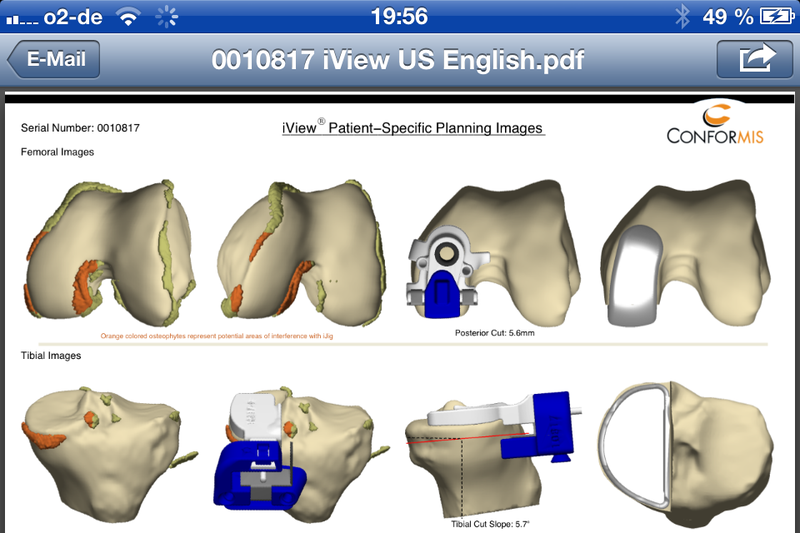 Thus, the knee is adjusted to the prosthesis (as a consequence so much bone must be sacrificed until the prosthesis fits) and not the other way round like in case of a customized production. 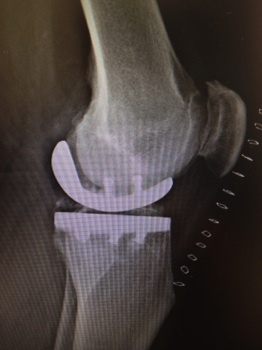 Another disadvantage is, that the position of the prosthesis must be found via a navigation process, which is intraoperatively (thus during the surgery on the opened knee) very complex. This can take up to 30 minutes. Furthermore, the robot is currently not able to insert the full prosthesis or to perform correct saw cuts. Only via a rotating ball cutter a flat surface is “approached”. Additionally for the navigation, two large nails must be inserted into the bone, clearly distant from the surgical area, in order to attach the navigation antennas. Due to the intraoperative navigation, which clearly prolongs the operation time, this means an additional risk of infection, which should not be underestimated. Moreover, the inside of the robot arms (pulls) are not fully reached by cleansing/sterilization so that a defect of the coverage would mean another risk of infection. Due to these reasons (no customized production available, no custom-fit template, complex intraoperative navigation on the opened knee, additional insertion of two nails, possibly insufficient sterilization of the robot system) I have given up the acquisition more than a year ago, after a detailed inspection of the system in Verona. Of course – like later others as well – I was lured by agents of the company with the promise, that advertising campaigns on the radio and TV (“First clinic in Germany with new robot system!...”) could increase the influx of patients requiring surgery – while in my opinion the information remains one-sided, populist and insufficient. Due to the disadvantages mentioned above and due to the knowledge, that I can operate with a better system and more individually using a customized prosthesis, I have gladly given up such a dubious campaign in favor of my patients.